The only two Cleveland-related pieces worth reading on Monday, it would seem, came from popular national outlets and painted divergent pictures of Northeast Ohio. One, published Sunday in the L.A. Times, was your standard travel piece. It documented the region's resurgence with familiar narrative constructions and suggestions for visitors: "Cleveland, once called the mistake on the lake," read the headline, "is on the cusp of cool." Unlike many a blurby, promotional Cleveland listicle, to its credit, the L.A. Times piece featured actual reporting — that is, quoted material — and gave a rare shout-out to the Cleveland Museum of Natural History alongside tried-and-true attractions like the Rock Hall, the art museum and the West Side Market. It was a perfectly adequate example of what you're likely to find in any big newspaper's Sunday travel section. But its tone, for those locals who have paid attention to Cleveland's curated ascendant image, was as eye-rollingly bland and promotional as material from the tourism bureau itself. "I am sitting on the deck of a once-derelict building that is now the city's trendiest microbrewery, watching the sun set over old smokestacks, the arches of early 20th century bridges and a river that once burned, and I am thinking that something intriguing is happening in Cleveland," wrote Fran Golden, to kick things off. "The city is getting, uh, cool. Cleveland? Yes, Cleveland." The dispatch can be seen as another feather in the cap of Dave Gilbert and the Dest. Cleveland marketing team, sure, but it was an awfully boring and meaningless read for those of us who've suffered the 'psssst —- Cleveland's cool' angle since the #ThisisCLE blitzkrieg of 2014. 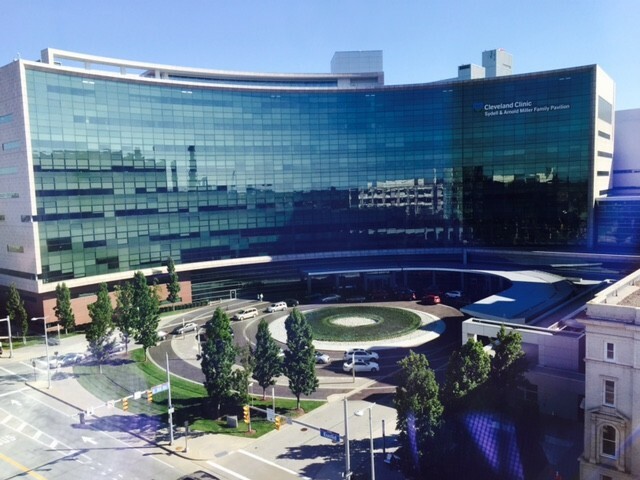 The second buzzworthy piece was a deeply reported probe by Politico Health reporter Dan Diamond about the "uneasy relationship" between the Cleveland Clinic and the neighborhoods that surround it. We've noted this juxtaposition frequently over the years, especially as it pertains to infant mortality. But reading Diamond's piece was a sometimes jolting experience. It featured commentary from the Clinic's "top tour guide" about the Opportunity Corridor — "The current road to campus 'goes through neighborhoods that people don’t want to go through'" — and a brazen defense of the Clinic's tax-exempt status by outgoing CEO Toby Cosgrove: “As soon as they start doing the same thing with the churches and the Salvation Army and the Red Cross and all the other tax-exempt organizations, we’d be happy to do our part,” Cosgrove said. The piece was no exposé, but it presented in refreshing depth the social and financial dynamics leading to an obvious (though largely ignored) local issue. In one illuminating passage, Diamond described the "perception problem" between what the Clinic thinks it does for the community with what it actually does. "Several Clinic PR staffers suggested that Microsoft CEO Natella’s interview with Cosgrove was an example of how the hospital opens itself up, with community members welcome to drop by," Diamond wrote. "But the free tickets to the one-hour session had been pre-booked online well in advance, and the overflow room was packed by staffers wearing doctor’s coats and Cleveland Clinic badges. (Many neighborhood residents said they weren’t especially interested in the talk, and didn’t know who Natella was.)" Local reporting should seek to shed continuing light on these disparities, and to pester major regional institutions with the same question that critics posed to Diamond: not if institutions are doing good things for the community, but if they are doing enough.